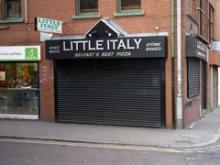 Little Italy is one of the few take away Pizza outlets in the city centre of Belfast. Popular place when the pubs and bars close at night. Have you got Google Earth on your computer? If so, then download the Google Earth Map of Little Italy. Is this the wrong position for Little Italy? If you think so, then modify its position. wonderfull grub from a wonderfull bunch of ppl, cant beat the service and the quality, thats whats kept me eating there for 5yrs and i aint plannin on stoppin!!! Jacks is the best place to go for a take away pizza in Belfast. Recommend the Sicilian. Cheap as chips too. Def. not expensive as it said previously?? Recommended Pizza's but be prepared to wait if going after bar hours. Quite expensive, however you'll be won over by the taste!